Our world is full of stimuli and presents us with new challenges every day. Watching the clock and checking our diaries we rush through our professional lives and then on to private appointments. Pressure and strain can be the result and in time lead to chronic tension. Often we have additional false posture because of occupational overuse or lack of exercise. The body tells us that something is wrong – e.g. after hours at the computer – through headaches, tired shoulders or back pain. Most people move through their lives in a routine way, i.e. with stereotyped patterns of reaction that often stand in the way of the functioning and mobility of the organism. Someone two metres tall perhaps makes himself smaller than he is and goes through life bent forward. Someone else pulls his head down between his shoulders for protection in difficult situations. The power of habit leaves its mark: we retain many forms of behaviour even when the original stimulus for them no longer exists; we become set in our patterns. The body is partially overburdened, partially underemployed – shortened or overstretched muscled muscles and tendons are the result. Illnesses can develop in the long run, e.g. musculoskeletal complaints, cardio-vascular or emotional problems. The Alexander Technique was developed around a century ago by the Australian Frederick Mathias Alexander (1869-1955) and has been successfully practised since then. Even at the time Alexander defined the body as a unity of all mental, emotional and physical processes. The Alexander Technique describes the central role taken by the atlas joint. This lies approximately in the centre of the head at the top of the spine – not visible to us like the knees or ankles, for example. Alexander discovered that a freely mobile atlas joint is prerequisite to the dynamic motion of the head, neck and back and the natural flexibility of the entire organism. If the atlas is held in tension, this diminishes the balance and coordination of the entire body. The Alexander Technique aims to regain the body’s original mobility, which arises from harmony between a mobile atlas joint and the musculoskeletal system. The technique works in three phases: 1. conscious perception of stimulation – 2. conscious interruption of habitual reactions – 3. relaxed movement in a new way. During the Alexander lesson we first look inward and register our habitual movement patterns – e.g. tension in the neck and back when sitting down. The next step is to interrupt the impulse to sit down, and the third to carry out the movement in a consciously different way. So a spontaneous falling backward with a rounded back becomes a movement with a lengthened back and the head retaining its natural forward and upward alignment. The process is accompanied by instructions to think into certain actions, such as relaxing the neck so that the head can align forward and upward and the back lengthen and widen, or directing the knees forward and releasing the lower back. The Alexander teacher supports the student with specific movements and manually directs the inner perception of the neck, head, shoulders, back, hips or knees. 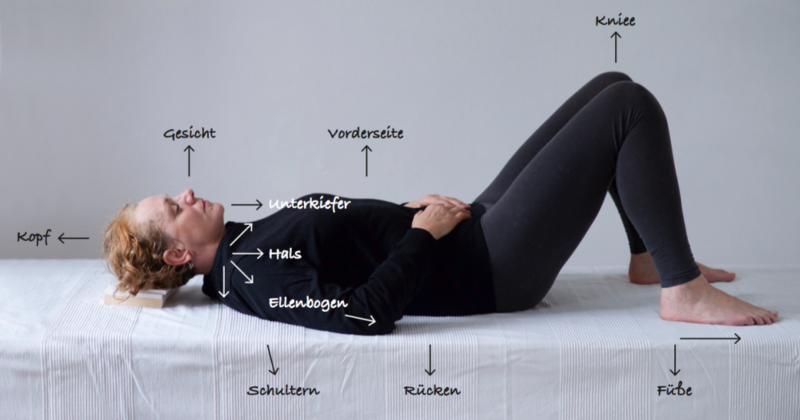 An analysis of basic movements such as sitting, lying down, standing up and walking develops the harmonious execution of more complex activities. The aim of the tuition is to interrupt routine procedures and to acquire new (or reacquire old) dynamics that can be applied immediately in one’s everyday life. The Alexander Technique fosters the mindful use of the self and a gentle, health-enhancing quality of movement. What is learned during a lesson can be applied anywhere and at any time at work or leisure. Someone who integrates the Alexander Technique into his or her daily round will increasingly and quickly be able to feel existing tension and discard restricting habits. Can the Alexander Technique help me? This tuition in perception and movement can help chronic back pain, headaches and complaints of the entire musculoskeletal system. The technique is also extremely helpful with disorders resulting from stress, as tension is reduced and the body enabled to regain its natural alignment. Musicians, singers, actors, sportspeople and those needing a favourable public appearance can work on their physical presence with the aid of the Alexander Technique – for if we are upright and inwardly relaxed we can encounter others with the power of our personal charisma. Pregnant women who want to respond consciously to their changed bodies or people with restricted movement due to operations can receive valuable stimulus from the technique, and a new, natural mobility.